Snack-friendly - perfect on a cracker for a quick and nutritious pick-me up - add a little drink of water or something not sugary to keep you feeling hydrated. Deliciously creamy mild cheese spread. Good source of calcium and source of protein. A fridge staple - long shelf-life and individually-sealed portions. Suitable for eating during pregnancy. No added colours or preservatives. Suitable for vegetarians. Mild and mellow, creamy and tasty, my Laughing Cow Original cheese triangles are no ordinary cheese spread. Have you tried my Laughing Cow triangles on a cracker? Smooth cheese on top of your favourite crunchy cracker and you have the perfect snack for those mornings when everything is such a rush you get to elevenses and realise you haven't eaten a thing. Or even better for that late-evening snack attack, when you fancy a little bit of a treat at the end of the day. Add a drink of water or light drink to keep hydrated. My Laughing Cow triangles are a friend in your fridge - they'll bring a smile to your sandwiches or some taste to your toast! Bring on the laughter! And naturally, my Laughing Cow triangles are a great source of calcium, a source of protein and contain no added colours or preservatives. 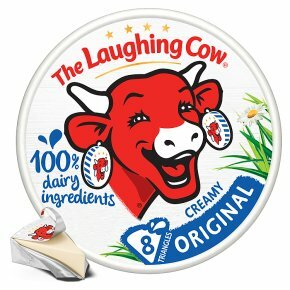 Top up your trolley with some Laughing Cow Original triangles today!